CONTENTS: * 1 Polyresin Statue * Contents Come New In An Individual Box With A Precut Styrofoam Insert For Added Shipping Protection MATERIAL: * High Quality Stone Resin That Can Be Placed Indoors Or Outdoors SIZING: * 13" Tall 6" Base 9" Wide * Please See Sizing Image For More Details ABOUT FUNNY GUY MUGS: This Statue Was Designed & Created Exclusively By Funny Guy Mugs. Funny Guy Mugs Is A Trusted Company Founded By Brothers Whose Mission Is To Create High Quality Products That Put A Smile On Your Face. HIGH QUALITY: This Statue Is A Notch Above Your Average Statue! Hand Molded & Painted With Extreme Detail To Make This Creation Come To Life!! Also Constructed Of High Quality Resin To Withstand Outdoor Conditions. CAT, GNOME & UNICORN SAFETY: Safety Is A Priority To Us!! We Make Sure Your Statue Has A Safe Journey To Your Home By Individually Boxing Him/Her With A Pre-cut Styrofoam Insert For Added Shipping Protection. 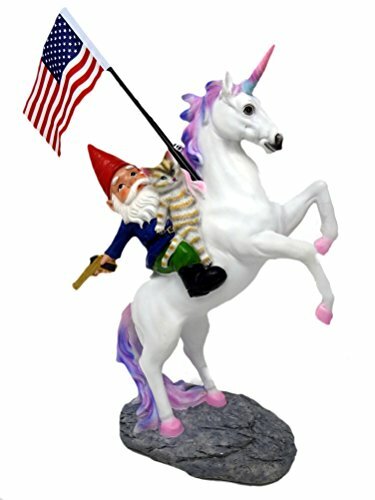 DESIGNED FOR GREATNESS: Unicorn PLUS A Cat PLUS A Gnome PLUS An American Flag PLUS A Gold Gun Equals An Epic Statue!! A Removable American Flag Is Included With Each Statue!! Merica!! A UNIQUE GIFT: Imagine The Look On Their Face When They Realize You Didn't Just Buy A Lame Gift But A Gift With Character! Perfect Gift For Christmas, Birthdays, Father's/Mother's Day Or Even As A White Elephant Gift! Fits Perfectly On A Desk, Mantle, Countertop, In The Garden Or Anywhere Greatness Is Needed!! 100% SATISFACTION GUARANTEE: This Official Funny Guy Mugs Creation Was Created To Last & Put A Smile On Your Face. If you have any questions about this product by Funny Guy Mugs, contact us by completing and submitting the form below. If you are looking for a specif part number, please include it with your message.